(c) To prevent the temporary or permanent contamination of soils, surface water, and ground water on Devens. General Requirements. Projects located in the WRPs shall utilize those BMPs most appropriate to the site conditions, with consideration given to the level of protection needed in the particular WRP. Provision of appropriate BMPs will further the goals of pollutant reduction of total suspended solids, petroleum hydrocarbons, lead, zinc, copper, and total nitrogen and other non-point source pollution. The BMPs and other protective measures for each WRP increase progressively from the Watershed WRP, to the Aquifer WRP, to the Zone II WRP. The Zone II Requirements include those for the Watershed and Aquifer WRP, while the Aquifer WRP includes the Watershed WRP Requirements. All projects in the Watershed WRP shall comply with the By-Laws (Article XI), the SMS, the Devens Water Resources Protection Report, November 1994 and the Stormwater Plan, including, but not limited to Water Conservation Measures, Storage and Application of Deicing Materials, Transportation of Hazardous Materials and Waste, Hazardous Waste and Materials, Storage Tanks, Radioactive Materials and Medical/Research Wastes. Water conserving plumbing fixtures (EPA Water Sense labeled or equivalent) shall be utilized for all projects to the maximum extent feasible. Such fixtures shall meet the Massachusetts Plumbing Code. Facilities that store or propose aboveground storage of oil in quantities greater than 1,320 gallons, and/or in any container greater than 660 gallons in capacity, and/or underground storage of oil greater than 42,000 gallons, are regulated under 40 CFR 112 and are required to develop a site-specific Spill Pollution Prevention Control and Countermeasure Plan (SPCC) that meets the requirements of 40 CFR 112 and the Devens Master SPCC Plan, dated February 27, 2001 http://www.devensec.com/forms/spill_prevention_report.pdf . Devens also has a Comprehensive Emergency Management (CEM) Plan to address preparedness, response, mitigation and recovery for man-caused emergency situations and natural disasters. Within the CEM Plan is a Hazardous Materials Emergency Plan. SPCCs shall be consistent with the CEM Plan and Hazardous Materials Emergency Plan. Facilities that are regulated under 40 CFR 112 may also be subject to the Facility Response Plan requirements set forth in, 40 CFR 112.20. Pesticide applications shall not be used unless there are no other means of controlling pests. Organic fertilizers shall be used in place of chemical applications to the maximum extent feasible. Projects that propose pesticide applications on more than 1 acre of land shall prepare an Integrated Pest Management (IPM) Plan in accordance with the Massachusetts Department of Food and Agriculture Pesticide Bureau IPM Kit for Building Managers http://www.mass.gov/agr/pesticides/publications/docs/IPM_kit_for_bldg_mgrs.pdf . Such plan shall be submitted to the DEC as part of a Unified Permit Application. Fertilizer and pesticide application amounts shall be based on soil testing. Blanket fertilizer and pesticide applications shall be prohibited. The use of motorized off-road recreational vehicles shall be prohibited within the DREZ. Any facility subject to 310 CMR 30.660 that receives Hazardous Waste after July 26, 1982 shall monitor for specific constituents, in accordance with 310 CMR 30.662. Provide a Hazardous Material Spill Response Plan that lists methods for the interception and isolation of potential spills of hazardous materials for review and approval by the DEC as part of a Unified Permit Application. Clean-up of spills shall be completed in accordance with the Hazardous Material Spill Response Plan or as specified in the Devens Spill Prevention Control and Countermeasure Plan. Include a list of all Hazardous Materials proposed to be used on-site (type, quantity, location and method of storage). h.	Pollutant-testing parameters and methods of testing. Pollutant-testing parameters in accordance with 310 CMR 30.664 and shall include as a minimum, EPA Priority Pollutants, total petroleum hydrocarbons (as required by ASTM D3328-78), metals (lead, zinc, copper), oil and grease, pH, and other pollutants consistent with the activities associated with the proposed use required to ensure that the development will not degrade water quality as determined by State and Federal drinking water quality standards. j. Compliance monitoring program in accordance with 310 CMR 30.671. Ensure post-development volume of discharge shall not exceed the pre-development volume of discharge for the two and ten year storm events as required by the SMS. Stormwater recharge shall maintain or exceed pre-developed levels of recharge for the two year storm event. In the absence of hydrogeologic analysis, stormwater systems that have been designed to recharge for the two-year storm event will be presumed to have met this criterion. If the site geology is unsuitable (for example, glacial till), the Applicant shall consider other stormwater infiltration BMP�s to meet this requirement. If none prove feasible, this requirement may be waived by the DEC, based on provision of sufficient data by the Applicant. Utilize BMP�s to comply with the SMS requirements for total suspended solids, petroleum hydrocarbons, lead, zinc, copper and nitrogen removal rates from runoff prior to groundwater recharging and/or stormwater discharging from the site. Water quality evaluations shall be based on a two-year storm event. Biofiltration systems for stormwater pollution mitigation are required to the maximum extent feasible. All projects that propose to utilize Hazardous Materials totaling 50 gallons liquid volume or 25 pounds dry weight or more in a calendar year shall register with the Devens Fire Department as required by 974 CMR 4.09(5). Commercial fertilizer storage and animal manure storage is prohibited unless such storage is within a structure designed to prevent the generation and escape of contaminated runoff and leachate. 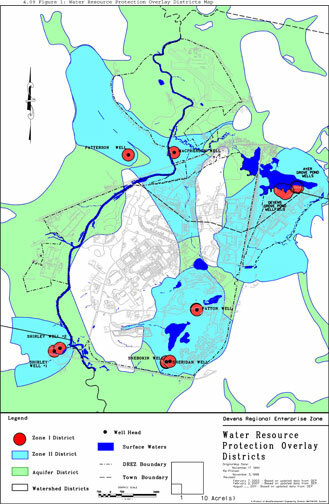 WRP Map: Zone II, Aquifer and Watershed WRP boundaries are shown on the map entitled: �Devens Regional Enterprise Zone Water Resources Protection Overlay Districts�. Prepared by MassDevelopment Engineering Division, in consultation with the DEC and the MA DEP, dated November 17, 1994, as amended. (974 CMR 4.09 Figure 1). Redefinition/redelineation of WRP district boundaries If the location of the district boundary in relation to a particular parcel is in doubt, resolution of boundary disputes shall be through the DEC. The burden of proof shall be upon the Applicant to show in which WRP the land should be located. The Applicant shall submit documentation certified by an Engineer, hydrologist, geologist, or soil scientist (as appropriate) to demonstrate more accurately the boundaries of the district with respect to the Applicant�s land. This analysis shall include testing as needed to demonstrate the correct classification of the land in question. (a)	Applicability The requirements below apply to hazardous material which is defined for purposes of this section 974 CMR4.09(4) as a product, waste or combination of substances which because of its quantity, concentration, or physical, chemical, toxic, radioactive or infectious characteristics may reasonably pose a significant, actual, or potential hazard to human health, safety, welfare, or the environment when improperly treated, stored, transported, used, disposed of, or otherwise managed. Hazardous materials include, without limitation, synthetic organic chemicals, petroleum products, heavy metals, radioactive or infectious materials, and all substances defined as "toxic" or "hazardous" under Massachusetts General Laws (MGL) Chapters 21C and 21E using the Massachusetts Oil and Hazardous Material List (in 310 CMR 30.000 and 40.000). Other than that which is allowed by state or federal laws, regulations, and/or permits, the discharge of hazardous materials within any WRP is prohibited. This prohibition includes, but is not limited to, discharges of hazardous materials to exposed and unsaturated soils; wetlands; surface water resources; ground water; sanitary sewers; storm drains; floor drains and sinks which discharge to the environment; and septic systems. The sale and/or use of septic system additives or cleaners not specifically allowed by MA DEP (310 CMR 15.027 & 15.028) is prohibited. Aboveground storage of hazardous materials shall be in product-tight containers, in an orderly manner, with wastes stored separately from unused materials, and on an impervious surface. Outdoor storage shall be designed to contain spills of not less than 110% of the volume stored and prevent any flow of product to exposed soils or outside drains, and shall be protected from the elements, accidental damage, and vandalism. Indoor storage shall be designed (via a berm or other means of secondary containment) to prevent any flow of product to exposed soils, floor drains, or outside drains. All storage shall be in accordance with 527 CMR 9.00. All Hazardous material storage areas shall be clearly delineated and signs shall be posted noting the dedicated nature of the area. Containers of all non-waste hazardous materials shall be labeled with the name of the product or chemical, a listing of the physical and health hazards associated with it, and target organ effects from exposure. Containers of hazardous wastes shall also be labeled as a "Hazardous Waste," with the name of the waste (e.g., "Waste Oil"), Hazardous Waste Generator ID#, and the date the container began accumulating waste also being noted on the container. The installation of new underground storage containers for Hazardous materials other than for chemicals used in the treatment of a public drinking water source is prohibited in all Zone II WRPs. Every owner or operator of a facility (including municipal, state and federal) which uses hazardous materials totaling fifty gallons liquid volume or twenty-five pounds dry weight or more in a calendar year and which is located within a Zone II WRP shall register with the Devens Fire Department on or before March 1, 2002 and every three years thereafter. A registration fee shall be paid to the Devens Fire Department at the time of registration and/or renewal. Existing and future underground storage tanks for Hazardous materials shall be registered with the Devens Fire Department in accordance with the requirements of 310 CMR 40.000. Any underground heating oil storage tank which does not meet current standards (as set forth in 527 CMR) for new and replacement tanks and is fifteen (15) years or older and is located within a Zone II WRP shall be removed and replaced or upgraded, to meet current standards, within five (5) years of the effective date of this Regulation, or sooner if directed by the Devens Fire Department. Registration requirements shall be established by the Devens Fire Department in accord with 310 CMR 30.00 and 40.00.
a. If, during or after the registration period, a change in ownership and/or occupancy of a business occurs, an updated registration shall be submitted to the Devens Fire Department within thirty days of the change. Registration is not transferable between past and future owners of a business and/or occupants of a facility. addition of new hazardous materials meeting the threshold quantity listed above which are not anticipated in the registration. Facility Closure. In the event that a facility permanently ceases operations during its registration period, the owner or operator of the facility shall notify the Devens Fire Department in writing at least 30 days before the closure. Household waste including garbage, trash, and domestic sanitary sewage. Wastes generated from the growing of agricultural crops and the raising of animals, including manure which is returned to the soil as fertilizer. The labeling of hazardous materials which are or will be exposed for sale at retail establishments. Treatment, Storage, and Disposal Facilities as defined by 310 CMR 30.000. Large Quantity Generators of hazardous wastes as defined by 310 CMR 30.000. Facilities that file Tier II reports as defined by SARA Title III. Notification: In case of a spill and/or loss of hazardous material at or above the "reportable quantity,� [as defined in 310 CMR 40.000] the owner/operator must report the spill or loss to the Devens Fire Department and MA DEP's Emergency Response Section within 2 hours of the incident in accordance with 310 CMR 40.0000. A map of the facility layout showing Hazardous Material storage areas and all means of egress, along with any additional details as specified by the Devens Fire Department shall be posted at one or more on-site locations. The posting location(s) shall be specified during registration. Materials Safety Data Sheets shall be kept on file at all times at an on-site location, and must be readily available during routine inspections and in the event of an emergency. Facilities shall provide adequate and reasonable employee training programs to ensure the proper use, storage, transportation and handling of hazardous materials. Facilities shall provide emergency spill containment kits on site and in accessible areas and all employees shall be trained in their use. (a)	Storage of flammable, combustible and explosive material shall be in accordance with the DEC Licensing and Registering the Storage of Flammables, Combustibles and Explosives Requirements, Policies and Procedures. A license for the storage of flammable or combustible fluids in quantities in excess of those allowed under 527 CMR 14.03 shall be obtained from the DEC.
(b)	In accordance with 527 CMR 6.08(b), propane gas stored in excess of 2,000 gal. also requires a license. Storage of Explosives may also require a license in accordance with 527 CMR 13. (c)	All license applications are subject to a Level 2 Review under 974 CMR 1.04 and require a public hearing. State form FP-2A on the MA Department of Fire Services website shall accompany the DEC Level 2 Permit Application. Devens Fire Department sign off on the License application is required prior to submittal to the DEC.
(d)	A separate permit for storage of flammable or combustible fluids is also required from the Devens Fire Department and must also accompany the License Application. (e)	The license shall be plainly posted on the premises. (f)	A parcel of land may only have one license for the storage of flammable or combustible fluids. (g)	If the conditions, capacities or restrictions authorized by a license change, an amended license shall be obtained. A new Level 2 application shall be submitted to the DEC and a new public hearing is required. If granted, the amended license supersedes and replaces the old license, and will show the aggregate total capacities allowed under the grant. A Certificate of Registration (State Form FP-5) shall be filed with the DEC by the license holder or occupant of licensed land annually, before April 30. This registration signifies that a license is in use and currently being exercised. A Certificate of Registration is considered a Level 1 Review (Administrative Approval). If a registration is not applied for and issued annually by May 30, it may be viewed as cessation and cause for review and termination of the license. A registration shall be posted on the premises in a way in which it is visible. Floor drains in accordance with applicable state (310 CMR 27.00 underground injection control) regulations and applicable federal laws and regulations, no floor drain(s) shall discharge to the ground, a leaching structure, or septic system in any facility. All floor drains shall connect to the sanitary sewer. All existing facilities with floor drains shall comply with 974 CMR 8.08. Penalties Failure to comply with provisions of this regulation may result in enforcement action (974 CMR 1.14).